Is Slicing Pie a Scam? We’ve all heard it: “life isn’t fair.” A phrase that rarely provides any comfort at the time it is heard, its real meaning is that you won’t always get what you want. People often want what they don’t deserve, especially when they think they can get away with it. Traditional equity splits are basically a means for people to justify getting what they don’t deserve. In fact, traditional splits are so good at getting people what they don’t deserve, many people actually believe that they deserve what they don’t deserve. When a person doesn’t get what he deserves, it’s not fair. If the person who denied him what he deserves knows it’s not fair, it’s a scam. It’s no surprise that when a person doesn’t get what he believes he deserves he calls it a scam, even though he never deserved it in the first place. Traditional equity split models are always unfair, yet they are so ingrained in our startup culture that people believe in them, even when faced with the logic of fairness. Slicing Pie reflects the logic of fairness. An equity split is either fair or it’s not fair. There aren’t multiple versions of fairness, there is only one. 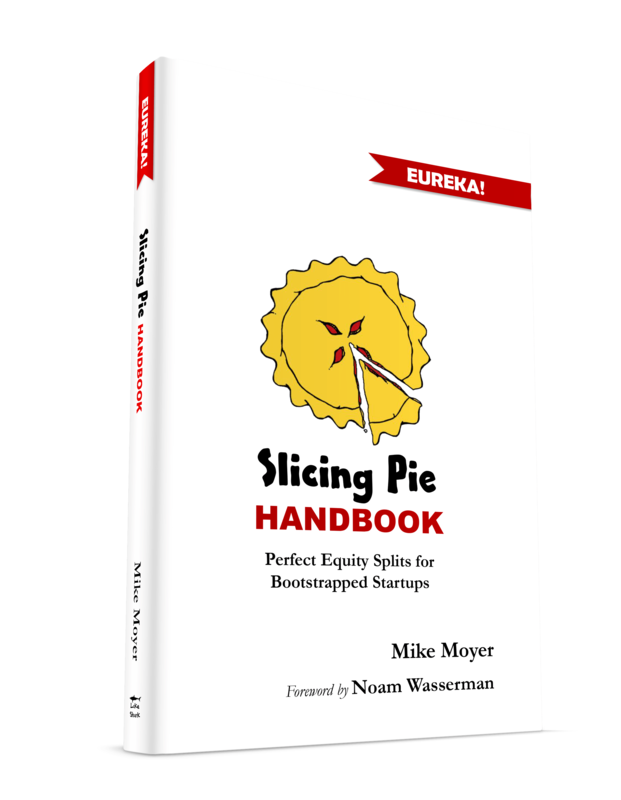 Slicing Pie provides a logical framework for creating a fair equity split. Within that framework is an outline of what happens when someone leaves a company under various circumstances. In some cases, an individual would lose his or her slices and in some cases an individual would keep them. In Slicing Pie, a person would lose their slices in the Pie if he or she was terminated for good reason or resigned for no good reason and any cash contributions would be paid back when possible. Understandably, people don’t like losing their slices and may actually believe they should keep them. Sometimes, when facing this consequence, they will assert that losing slices is somehow unfair. I’ve even heard people refer to this consequence as a “scam.” It’s not. Losing slices under these conditions is a logical outcome given the nature of the behavior. The project isn’t as much fun as Sam thought it would be, so he quits. This is resignation for no good reason. Obviously, because he is the only participant, the startup would fail and Sam will never be paid for the time he invested and his $10,000 is gone too. Alternatively, he may not actually quit, but instead he fritters away his time playing Fortnight. If he had a manager, he would probably get fired for this kind of behavior which is known as termination for cause. Again, the startup would most likely fail and Sam will never be paid for the time he invested and his $10,000 is gone too. No matter how much time or effort Sam puts in or how great his initial work was, it’s all gone if he engages in behavior that ends the company. Nobody would say that it’s not fair that he lost his investment, nor was he scammed. He simply behaved in a way that lost his investment. Furthermore, Sam’s startup may have great potential, but he still ended it. Under the right circumstances, someone else could have picked up where Sam left off, but it would still be over for Sam. Let’s pretend Sam has a partner, Keith, who can carry on the startup. Both of them are held to the same standard—Slicing Pie. If Sam quits or stops performing, there is no reason why Keith should have to account for Sam in the future success of the company. For Sam, the game is over and for he is out of business. It wouldn’t be fair to Keith to have to carry a deadbeat partner—even if Sam’s contribution was valuable. If Sam wants to benefit from his work he should continue to do his best every day. He shouldn’t quit and he shouldn’t stop doing good work. Keith’s job is to help Sam as a member of the team, it’s not to protect Sam’s investment if Sam gives up. Slicing Pie imposes the same logical consequences on all participants in a startup. Everyone has a choice every day. They can do their work the best they can or not. If not, they lose. It’s not personal, it’s not punishment, it’s just business!